Following the success of the first Thai Gastronomy Series I, Michelin one-star Sra Bua by Kiin Kiin is pleased to announce an exceptional collaborative “Thai Gastronomy Series II” on Saturday 8 June 2019, featuring Chef Chumpol Jangprai from one of Bangkok’s most innovative fine-dining establishment: one-Michelin-star R-Haan, Wisdom of Thai Cuisine. 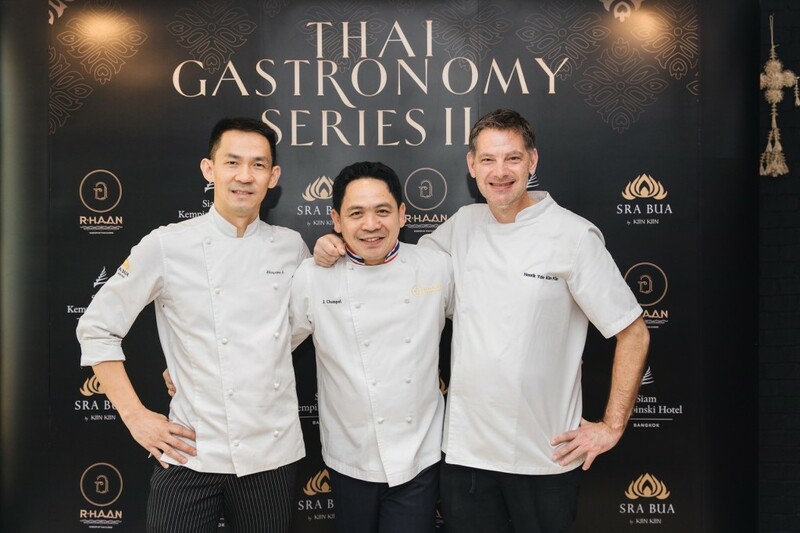 Three culinary masters, each famed for producing memorable and innovative Thai cuisine, will join hands to create a six-course dinner that focuses upon Thai gastronomy with innovative interpretations. This exclusive dinner brings together guest chef Henrik Yde- Andersen, founder of Kiin Kiin restaurant in Copenhagen and the inspiration behind Sra Bua by Kiin Kiin; chef Chumpol Jangprai, Co-Founder of R-Haan Thai Fine Dining; and Sra Bua by Kiin Kiin Head Chef Chayawee Sutcharitchan. 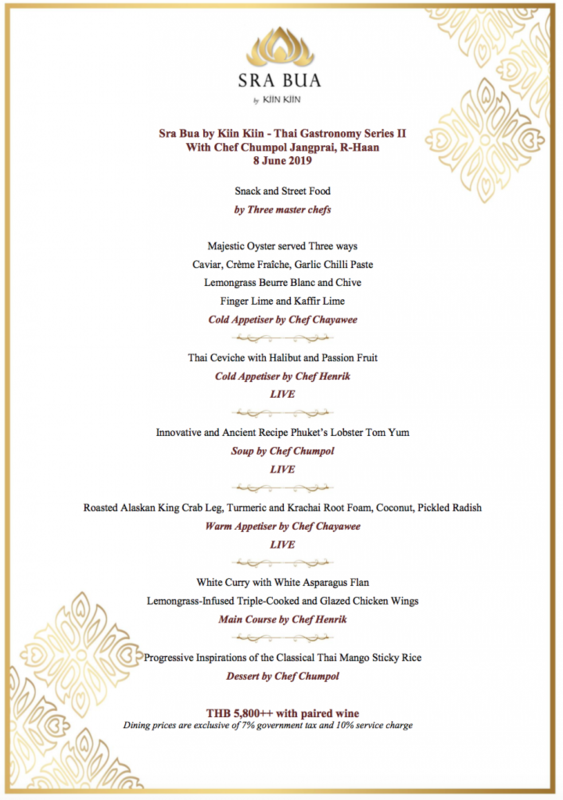 Together they will prepare and showcase an extraordinary “Thai Gastronomy Series II” dinner. “This latest exquisite collaboration is between chefs of Michelin one-star restaurants with a proven passion to escalate Thai gastronomy to the next level. 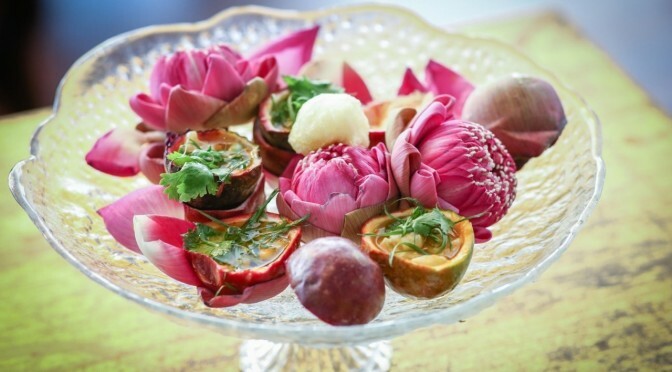 They will adapt the popular concept where guests witness theatre-style performances of the chefs and their team members as they prepare and present each course,” explained Alex Pichel, General Manager of Siam Kempinski Hotel Bangkok. Each will create and produce two courses with interactive live-cooking demonstrations, tantalising guests as they create a very special culinary journey featuring different flavours and textures, each created with impressive passion and flair. Dishes created for this six-hand culinary collaboration include Thai Ceviche with Halibut and Passion Fruit by Chef Henrik Yde-Andersen; Phuket lobster tom yum prepared by Chef Chumpol Jangprai using a traditional recipe handed down through several generations; and roasted Alaskan King Crab Leg served with Turmeric and Krachai Root Foam, Coconut, and Pickled Radish by Chef Chayawee Sutcharitchan. Sra Bua by Kiin Kiin – Thai Gastronomy Series II with Chef Chumpol Jangprai will see the three culinary masters join forces to create an unforgettable experience for an exclusive collaborative dinner for one night only on Saturday 8 June 2019. The dinner will include a wine pairing with each label selected carefully to complement the dish, priced at THB 5,800++ per person for six courses. Voted as one of Asia’s 50 Best Restaurants in 2014 and 2015, and having been awarded a Michelin one-star rating in the “Michelin Guide Bangkok, Phuket and Phang-nga 2019”, Sra Bua by Kiin Kiin offers a dining experience that is a true culinary adventure. The modern Thai-inspired cuisine with exciting contemporary touches never fails to surprise and delight diners. The aim of the restaurant is to dazzle and form a memorable culinary experience for every guest. Chef Chayawee invites guests to enjoy an extraordinary culinary performance as chefs choreograph different tastes of basic Thai ingredients from traditional recipes in daring combinations. Behind Sra Bua by Kiin Kiin’s exquisitely composed food presentation using global cooking techniques, the familiar flavours of traditional Thai dishes are well maintained. The cuisine is widely recognised as “modern gastronomy at its best” – making it very different from home-style cooking. 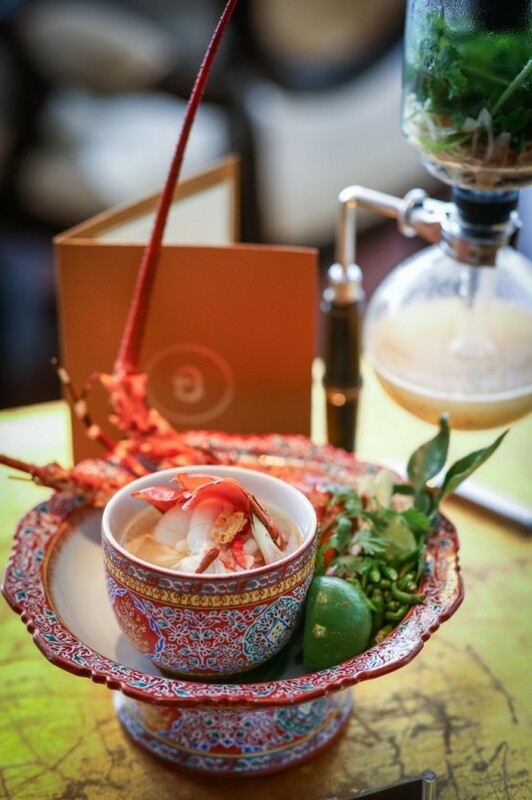 Diners may experience a curry served with the texture and temperature of ice cream and bites of lobster locked inside gelatinous pearls that melt in the mouth with a sip of Tom Yam broth. Everything from fish sauce to prawn crackers is home-made in the Sra Bua by Kiin Kiin kitchen. Chef Chayawee Sutcharitchan, or Chef Berm, is a Thai national who fell in love with gastronomy when he began his journey in 2004 in the United States of America, where he thrived working in the kitchen. He obtained his Certificate in Culinary Arts at the Collin County Community College in the United States. Despite his prior education in computer science at Texas A&M University, Chef Chayawee decided to continue on his culinary journey. In 2006, Chef Chayawee returned to Bangkok, Thailand, where he continues to express his love and passion for gastronomy. He gained work experience and honed his culinary skills at numerous five-star hotels. His work experience highlights include time at The Landmark Hotel in Bangkok, where he worked as Chef de Partie, and InterContinental Bangkok, where he worked as Junior Sous Chef for two years before he joined the Kempinski family. Chef Chayawee joined Siam Kempinski Hotel Bangkok in 2010 as Sous Chef at Brasserie Europa. In 2012, he transferred to the hotel’s signature restaurant, Sra Bua by Kiin Kiin, also as Sous Chef. After two years of hard work and devotion, Chef Chayawee was promoted to Head Chef of Sra Bua by Kiin Kiin in 2014. Chef Henrik Yde-Andersen’s culinary journey began in his early years and as a junior chef, he was already well trained in traditional French cuisine and had worked in several European countries. Life then led him, as though by destiny, to the world of Thai and Asian cuisine. 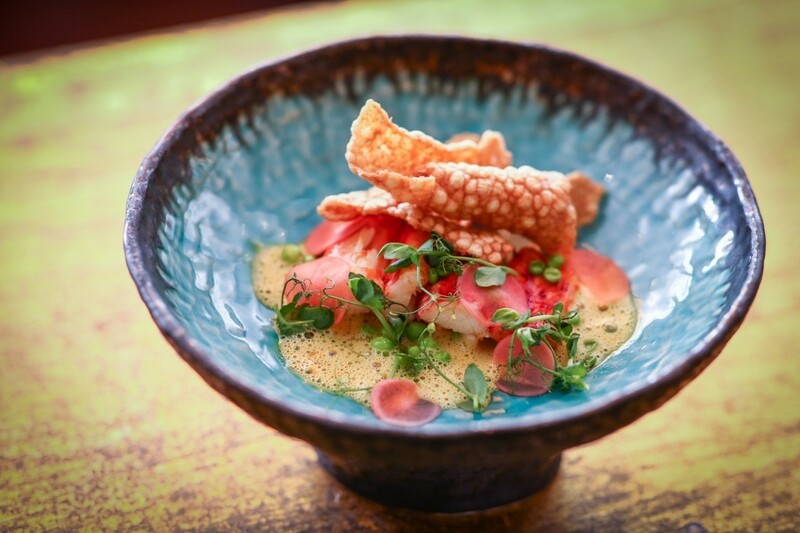 His own innovative modern Thai restaurant, Kiin Kiin, in Copenhagen has enjoyed Michelin one-star status since 2008. The open-minded and innovative Danish chef fell in love with Thai cuisine when he made a trip to Thailand in 2000. The holiday, meant to last ten days, became a life-changing experience as he stayed for five years living, working and travelling throughout the country to gain more experience in Thai cuisine. Famous for his innovative and outside-the-box thinking, Chef Henrik incorporates the art of Western cooking techniques into the original recipes, while preserving the Thai tastes. Behind beautifully composed food presentations, the familiar flavours of original Thai dishes are maintained. In 2009, during a promotional tour through Bangkok, Chef Henrik was approached by the Siam Kempinski Hotel’s pre-opening team with the opportunity to open a Thai restaurant at the hotel, based on the same concept as Kiin Kiin in Copenhagen. Sra Bua by Kiin Kiin was born in October 2010. A frequent visitor to Bangkok, which he considers his second home, Chef Henrik visits Sra Bua by Kiin Kiin regularly to review and adapt the menu and to train the restaurant’s team of talented chefs. He also takes part in promoting Thai food regionally and globally at events organised by the Ministry of Tourism and Sports, the Tourism Authority of Thailand, Royal Thai Embassies and various other organisations. Away from the kitchen, Chef Henrik, who is also a fully trained sommelier, has his hands full with his other businesses, including a winery in Spain, a brewery, where he partners with Mikkeller to produce beer using Asian ingredients, a coffee bean farm in Kenya and a business producing oyster and fish sauces. Together with his partner Lertchai Treeawatchaiwong, a Thai entrepreneur and hobby chef, he owns 18 restaurants, all serving Asian cuisine. In Thailand, Chef Chumpol Jangprai is a true celebrity, thanks to his appearances on television shows, including “Iron Chef Thailand”, in which giving him recognition as part of a new generation of culinary masters. Besides this, he has received numerous recognitions and has held lectures at prestigious universities and international cooking exhibitions and is on advisory boards of several leading companies include; Minor Food Group Public Company Limited, S&P Syndicate Public Company Limited, Singha Corporation Public Company Limited. Today, he is the co-owner of R-Haan (pronounced “ah-han” and meaning “food”), a fine-dining Thai restaurant that celebrates Thailand’s rich culture of food sources while raising the country’s traditional culinary flair to a level of its own.